The International Brotherhood of Electrical Workers Local 234 offered a two-day training in solar electric systems at their Salinas Valley facility for two hundred union members. There were ten training stations covering a range of solar topics and activities, such as solar site analysis and PV design. Clean Renewable Energy Bonds go to 805 recipients across the country. The list of recipients include projects in many states. Funded by the Energy Improvement and Extension Act of 2008 and the American Recovery and Reinvestment Act of 2009, these energy bonds help government agencies, public power providers, and cooperative electric companies obtain lower cost financing for clean energy development projects. In a move to dramatically carry California toward a renewable energy future, the governor signed an Executive Order, to increase the state's renewable energy portfolio standard to 33 percent by 2020. Mike Arenson will be giving a talk on solar energy at the Green Living series Wednesday night. His presentation will include highlights of his own green living choices, and the different ways to use solar energy in your home and business, such as solar electricity, solar water heating and cooking with the sun. He will answer your specific energy questions and emphasize the financial considerations of using solar, including prices, rebates, tax credits and other incentives. Time: 6 :00- 8:00 p.m. Location SC41 2647 41st Ave. Santa Cruz, CA. The California Solar Initiative (CSI) incentive for solar electric systems in the PG&E territory is dropping from $1.55/watt AC to $1.10/watt AC at any moment. This applies to residential and small commercial PV systems. According to the CSI's incentives tracking website, Trigger Tracker, the funds remaining at the higher rate are less than funds under review for allocation. In other words, it is very unlikely there are any $1.55/watt AC funds. The rebate will drop to the next step of $1.10/watt AC. Over the past 10 years, the rebates for solar electric systems have changed significantly. They started at $3.00/watt, and increased to $4.50/watt AC several years ago. They have declined steadily since. Following rumors and debate about cash payments to businesses going solar in lieu of receiving the 30% tax credit, the feds have published new guidelines on how to receive these stimulus funds. Instead of waiting for a tax credit, eligible businesses will receive a payment check from the US government. There are great solar installation statistics available at your fingertips at the new CSI website, California Solar Statistics. If you are wondering how many PV systems have been installed in the state, or what the average size or cost of PV systems are, this is the place for the updated information. O'Neill Sea Odyssey is adding solar power to their non-profit ocean education center at the harbor in Santa Cruz. The organization will use the electricity to power their office and other businesses located in their building at the Santa Cruz harbor. More than 500 students a year take part in the OSO educational programs, teaching students from schools throughout Central California about the marine habitat and the importance of the relationship between the living sea and the environment. The organization's founder, Jack O'Neill, is widely recognized as the inventor of the wetsuit which helped revolution the surfing and ocean sports industry. The solar electric system will be installed by Ron Goad of Solar Construction. A cash rebate from California will pay for about 25% of the cost of the system. Solar Mike and Solar Construction are contributing $3500 of in-kind contribution toward the installation. The Solar Energy Industry Association (SEIA) has released a guide to the federal American Recovery and Investment Act as it pertains to solar energy. Download a copy of their guide here. Download a copy of the guide. Department of Energy Secretary Chu Announces Changes to Expedite Economic Recovery Funding. A sweeping reorganization of the DOE dispersal of direct loans, loan guarantees and funding contained in the new recovery legislation is planned. The Department of Energy will begin offering loan guarantees under their previous loan guarantee program by late April or early May, loan guarantees under the new Recovery legislation by early summer, and disperse 70 percent of the investment from the American Recovery and Reinvestment plan by the end of next year. Author and energy activist Van Jones spoke at the Martin Luther King Convocation in Santa Cruz nearly filling to capacity the Santa Cruz Civic Auditorium. The free event drew people from throughout the Bay Area to hear Jones emphasize the quality of change needed to bring about "The Green Collar Economy." The Santa Cruz Sentinel reported on solar tax credits and featured Solar Mike's new customer, councilmember Rotkin, who installed his own solar electric system. See the article here. Solar Mike spoke to more than 200 people attending the International Baccalaureate science group at Scotts Valley High School. The theme for this year's project was Solar Energy. Seventeen student groups presented their findings on a variety of solar topics, including concentrating solar power systems, and low-cost solar disinfection of drinking water. The international solar power conference was held in San Diego, bringing together more than 20,000 people interested in solar energy. Angel investors were shoulder to shoulder with construction workers, solar geezers, and the suited global community. Solar Mike gives the "cool product of the show" award to Konarka, for their transluscent thin-film solar plastics. These flexible panels are offered in an array of shapes and colors, breaking the mold for what a solar panel looks like. In a letter to the editor in the Santa Cruz Sentinel, Solar Mike wrote: "I've attended nearly every major solar conference in the past thirty years. There was more business happening at this event than in all those previous conferences, combined. From solar panels on home rooftops to covering thousands of acres in the western desert, the solar industry is booming." The President has signed a revised $700 billion dollar financial bailout plan. The plan includes incentives for solar, wind power and energy efficiency. Among many items included in the legislation are: 1) 30 percent solar energy tax credit extended until 2017; 2) Allows energy credit to be taken against the Alternative Minimum Tax; 3) Wind tax credits; 4) Energy conservation projects for buildings; 5) Credits for new energy-efficient appliances; and 6) Lower taxes on oil related qualified production activities. Further information can be found at the Solar Energy Industries Association news report. Solar Mike has received the NABCEP Certificate of Knowledge from the North American Board of Certified Energy Practitioners. The association provides examinations and certifications for professionals in the solar and energy industries. A Green Trade Network Summit was held in Santa Cruz. It was organized by the Monterey Bay International Trade Association. Solar Mike gave a brief presentation on "Solar Energy: Global Actions and Opportunities". This included an overview of the global solar energy industry. He highlighted opportunities in solar products and manufacturing in Europe and China, and solar for off-grid telecomm systems in Latin America. Real Goods has acquired local solar company Independent Energy Systems, a Sunpower dealer. A business article in the Santa Cruz Sentinel described the terms of the deal. The news first appeared in Wall Street Jounal Marketplace. Solar Mike was interviewed, and said that the solar market is still expanding despite an economic slump and disappearing financial incentives. NABCEP has released its latest Study Guide for solar professionals, available for free on the NABCEP website. This guide is an excellent summary of the technical aspects of solar electric power systems, and would be of use to anyone looking for in-depth educational materials on solar. The solar installation class at San Jose City College was featured in the business section of the San Jose Mercury News. Graduates of the class are qualified to take the NABCEP exam, and are grabbing solar jobs in the Bay Area. Solar Mike will be a guest speaker in the class next week, introducing students to the design of off-grid solar power systems, and sharing his reflections on the solar industry. More than 10,000 people attended Intersolar North America held in San Francisco this week, in conjunction with SEMICON West. Solar Mike noted changes in the industry, including an increasing number of Chinese solar manufacturers, and a dramatic rise in European companies selling, or investigating, solar thermal in the U.S. market. Everyone was talking about the tough affects the end of the federal solar tax credit will have on the U.S. PV market next year. PG&E electric rates are going up, again, over 6.25% on average, over the next 8 months. PG&E announced rate increases for October 2008 and january 2009. It attributed increases to the rising cost of natural gas and less availability of hydroelectric as rainfall levels are low this year. Designs for a Green Future: The Transportation---Land Use Connection. 6:45 p.m. Forum at the Live Oak Grange Hall, 1900 17th Ave., Santa Cruz. Principles of land-use design that make for walk-able and transit-friendly communities. With speakers from UC Berkeley and the NRDC. Earth Day 2008. Local author Chuck Tremper has released his new book, "As the Ocean's Rise. Meeting the Challenges of Global Warming." Focusing on the many ways people can take action on global climate change, the book is filled with rich stories and local characters making a difference. Solar Mike is profiled in Chapter 6: Getting the Carbon Out - Alternatives to Business as Usual. The book can be ordered from Chuck at his website www.astheoceansrise.com. 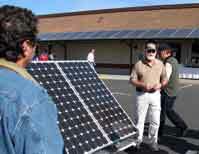 A course on solar design and installation is now being offered at San Jose Community College. Solar Mike spoke to the class about solar electricity, hot water, and the hot prospects in the solar job market. Good Times newsweekly published their Home and Garden special issue, in conjunction with the Santa Cruz Beach Boardwalk Home and Garen Show. A two-page article highlighted Solar Mike's ideas and activities, spanning his 32 years in the solar field. Solar Mike was a featured speaker at the Green Living Workshop sponsored by Financial Advisor Cheryl Rebottaro of Morgan Stanley. His talk highlighted both community solar projects and the international demand for solar energy systems. Other speakers included energy investment guru Geoffrey Ashton, Senior Vice President of the Calvert Group. Scientists from around the country are taking part in "Solar Week", hosted by NASA and other institutions. 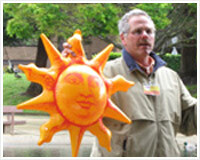 Solar Mike brings his expertise to answer questions posed by students and the public about solar energy. Topics for discussion include The Sun, Solar Energy, and Solar Careers. Solar Mike presented a two-hour lecture and slide show at Cabrillo College's newest course on energy, "Solar Photovoltaic Design and Installation". One of the few college solar classes in the state, the course is designed to help prepare students for their NABCEP certification, and get jobs in the solar industry. Mike covered the basics of how solar electric systems work, sun and sky geometry, and how to do a site visit. He explained that the solar business is very competitive, especially in the Bay Area. "Find a niche in the industry," he said, "something that distinguishes you from what all the other solar installation companies are doing." Instructor Joe Jordan and the students invited Solar Mike back to do another presentation later in the semester. The Women's Health Center in Santa Cruz is the first downtown business to install solar panels. They held an Open House to show off the solar as well as other green features in their recently remodeled building. On a typical sunny day the solar panels will generate enough electricity to power the building. In addition to the financial savings, there are big environmental benefits - reducing CO2, avoid making air pollution, and having cleaner air to breathe. The solar electric system was designed and built by Full Circle Solar. The radio airwaves we're buzzing with solar talk when Geoff Shuey and Solar Mike we're interviewed on KSCO radio with their solar customer Jim Chubb of Pacific Inland Home Mortgage. Chubb had Full Circle Solar install a solar electric system at his mountain home this year. "The numbers work," Chubb said. "I expect a payback on the system in 9 years." Referring to the team at Full Circle Solar, Chubb added "I endorse these guys. Their work is great." Callers to the weekly real estate radio program asked questions ranging from rebates to battery back-up systems. Construction has been completed on a solar power system for the home and office of Bob Landry, of Landry and Foy Builders. In addition to solar panels on the roof generating electricity, Landry has incorporated natural lighting into all the work areas, using large skylights. A self-professed "solar believer", Landry is enthusiastic about getting his electricity from the sun. And someday owning an electric car. Full Circle Solar party and activities were reported in the Santa Cruz Sentinel newspaper today. "The sun -- along with great food and wine -- was a powerful draw when Full Circle Solar held a solar party at its Sash Mill offices in Santa Cruz. More than 125 people turned out for the event. Many of those attending have solar power in their homes." To read the entire text visit Solar energy shines. CleanTech 2007 showcased solar energy as part of the Nanotechnology Conference in Santa Clara, CA. Questions about solar cell efficiency was the most asked question of the day at our booth. Mike Arenson and Bey Proctor spoke with an international crowd of scientists, engineers, business people and students. Their exhibit included the Sanyo HIT solar panel, the most efficient panel on the market. The San Jose Mercury News real estate section headlined solar power, "Solar Systems Going Mainstream", including an interview with Mike Arenson. For the full text of the article, click Going Solar. Step It Up, a national campaign on climate change, rallied in Santa Cruz. Mike Arenson was one of the featured speakers. He encouraged students to pursue careers in renewable energy, as he had done thirty years ago. 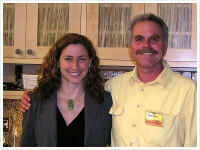 Arenson also noted the success and growth of the solar industry in Santa Cruz and the Bay Area. Local newspaper, the Santa Cruz Sentinel, highlighted Full Circle Solar in a feature article today in their Business section. The article begins "When Full Circle Solar started up a little over a year ago, the partners discovered it was too late to get listed in the phone book. Relying on word of mouth, they did more than $1 million worth of solar business. We've had a great first year, said founding partner Geoff Shuey, a Swanton resident with 30 years experience in solar energy and construction. Santa Cruz is an extremely strong market, added Mike Arenson, sales and marketing director for Full Circle Solar, noting that Darwin Street, where he lives, has three residential installations." For the complete text of the article link to the Santa Cruz Sentinel. Mike Arenson has begun solar design work on the remodel of the historic St. Francis Retreat, in San Juan Bautista, CA. Working with the sustainability team at Fall Creek Engineering, Arenson will provide design and planning of solar electric and hot water systems. The St. Francis Retreat is operated by the Franciscan Friars of California. It is recovering from a fire which destroyed the original 160 year old ranch house, last June. Learn about St. Francis http://www.stfrancisretreat.com/. California Farm Conference. Mike Arenson featured speaker in session on “Energy Alternatives for Farmers”. Recommends financing solar power systems through leasing or home equity. Solar Mike is carrying Open Energy System Solar Roofing Tiles to its custom building products. This unique solar product offers a high efficiency building integrated approach to installing solar electric systems. World Ag Expo showcases solar power. Farmers and ag producers looking at solar electricity as a way to bring down costs. PG&E discussed the latest information about California’s solar power incentives, the California Solar Initiative. They presented new options for getting paid to generate electricity from solar, and high-tech requirements for measuring the power generated. Solar rebates are declining quickly, faster than most people in the industry have predicted. Eco-Farm Conference. Solar in Agriculture featured on tour, and at Full Circle Solar exhibit. Solar Power on the Farm, featured in the Santa Cruz Sentinel. Live Earth Farm gets 80% of its electricity from the sun. Tom Broz, owner of Live Earth Farms, expects the system will pay for itself in 7 to 8 years. Solar Mike presents at the Smart Energy Management in Agriculture Conference, and tours the Live Earth Farm solar installation. New state Rebate program not ready to go, expected complete in the next 2 weeks. PG&E residential rates have gone up again! The latest rate schedule from PG&E shows an increase in the the highest tier price of electricity of 7%. The rebate is expected to drop to $2.50/watt on January 1, 2007. The program will be taken over and administered by the SGIP administrators. Stay tuned for more details. Congratulations to solar customer J.D. 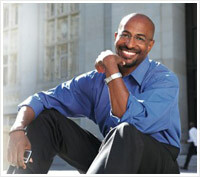 Hoye, who has been named president of the National Academy Foundation, an educational reform group. The foundation has received a $5 million grant from the Bill and Melinda Gates Foundation, to fund academies in high need urban districts. Hoye was a former director of the National School-to-Work office in Washington, D.C.